Goooood morning, and happy Sunday! It looks like another, cloudless, blue-sky day outside my bedroom, so a perfect morning to share these two luscious, summery desserts. 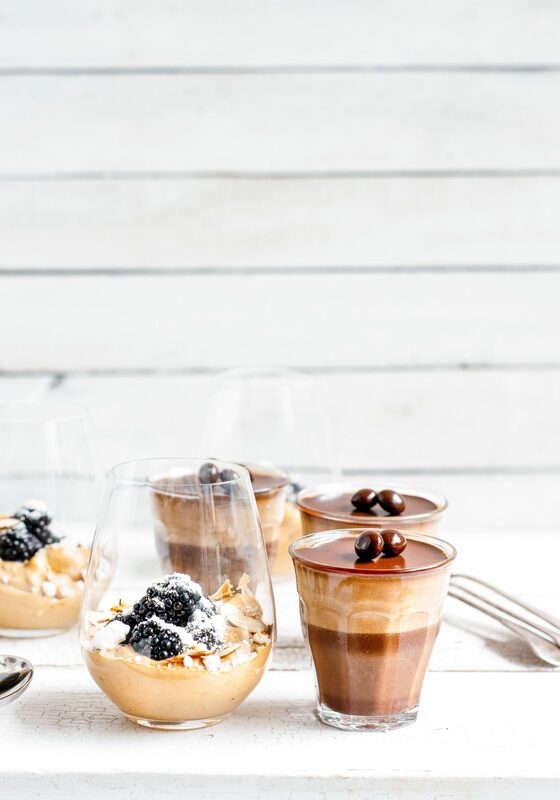 Both have a coffee base but with a twist – the first is an espresso panna cotta which is rich, cool and creamy, yet still light – magic. (The chocolate coffee beans are optional, but I do like the added texture and caffeine hit). The second is a totally indulgent caramelly coffee version of eton mess, swirled with crumbly meringue, toasty flaked almonds and topped with ripe tart/sweet blackberries…bloody irresistible. They are easy to make (as usual), but definitely flash enough for entertaining, ideal for enjoying on a balmy evening before the crisp weather comes and we’re turning to crumbles and steamed puds. Right then, God I’m just trying to think what I’ve been up to since the last post – its really a case of that French saying ‘the more things change, the more they stay the same’, with daily 10km walks, work on the book and time spent catching up with friends. This week I had a particularly fun night out with some of my best mates sampling the wares from the Cornbusters pop-up at Love Bucket in K’Rd, (light as air tempura corn balls with a variety of flavour-packed toppings), followed by dinner at SPQR. I always feel so grateful to have such good, friends to share a cheeky Negroni or two with (as well as coffees, dinners, whiskies, movies…), there is something so special about having people in your life who know you inside and out…and still want to hang out with you! Meanwhile the men/boys are back to business in Welly, both so independent and grown up now, it probably really is time to drop the ‘boys’ bit. Soon. OK then, not much more to report, time to lace up my walking shoes – enjoy the rest of the weekend and I’ll see you here again soon. Put 400mls of the cream, milk, sugar, and instant coffee granules into a saucepan and bring to a simmer over a gentle heat, simmer, stirring for 5 minutes until the sugar is dissolved. Add 70 grams of the chocolate then take off the heat. Leave to sit for one minute then whisk to incorporate the chocolate. While the cream and milk mixture is simmering, put the gelatine leaves in a bowl, cover with cold water and soak for 4-5 minutes or until soft. Remove and squeeze out the excess water. Add the gelatin leaves to the cream mixture and whisk until the gelatine has completely dissolved. 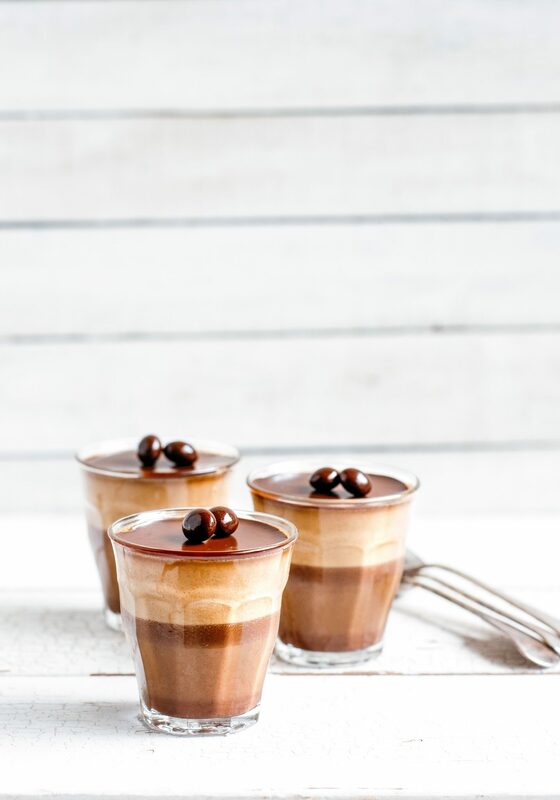 Pour the panna cotta into desired serving glasses and place in the fridge to set up for at least 6 hours or over night. The panna cotta will separate into lighter and darker layers. Heat the remaining cream in a microwave proof jug for 40 seconds. Drop in the remaining chocolate, leave to sit for one minute then whisk until smooth. (Heat for another 20 seconds if necessary). Leave the chocolate sauce to cool for 5 minutes then divide between the set panna cottas. Chill for half an hour then serve topped with chocolate coffee beans. Whip the cream to medium peaks in a large bowl. Heat the caramel condensed milk and instant coffee granule together in a microwave-proof bowl for 30 seconds. Whisk well then heat for a further 30 seconds in the microwave. Whisk again until the condensed milk is smooth and the coffee is dissolved. Refrigerate for 30 minutes. Fold the cream and condensed milk mixtures together. Crumble 2/3 of the meringue into the mixture and add 2/3 of the almonds. Fold together then plop the mixture into 4-5 serving glasses (dependant on serving size). Chill for one hour or up to overnight. To serve, divide the berries between the glasses, crumble over the remaining meringue and sprinkle with the remaining almonds.